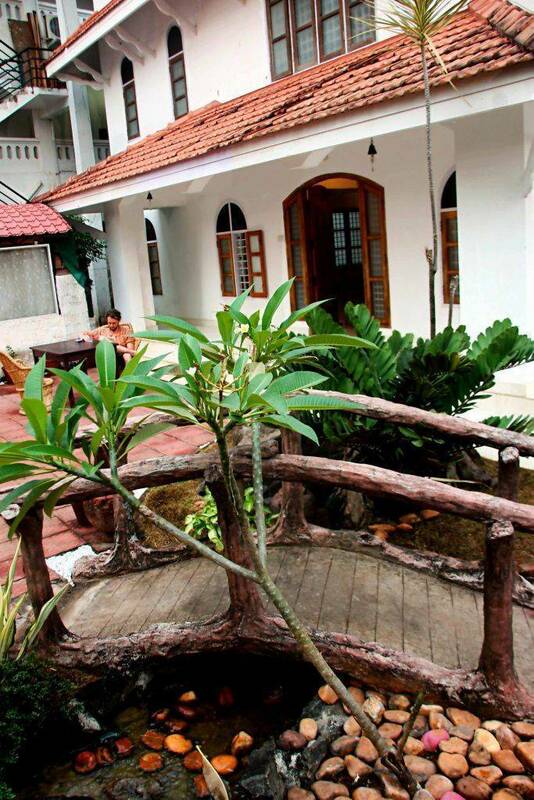 1 minute away from the beach, this warm and friendly backpacking hostel provides Air conditioning, free WiFi and 24 Hours hot waters guarantees supreme comfort, cleanliness, hygiene and security. Fun activities conducted every day make it a perfect venue for an exhilarating and exciting break away. Vedanta, the highest state of consciousness and self realization can be achieved only while traveling. Vedanta Wake up! India’s finest chain of backpacking hostels, was conceived to address the primary concerns of backpackers and budget travelers. Our rooms are designed keeping comfort and cleanliness in mind. 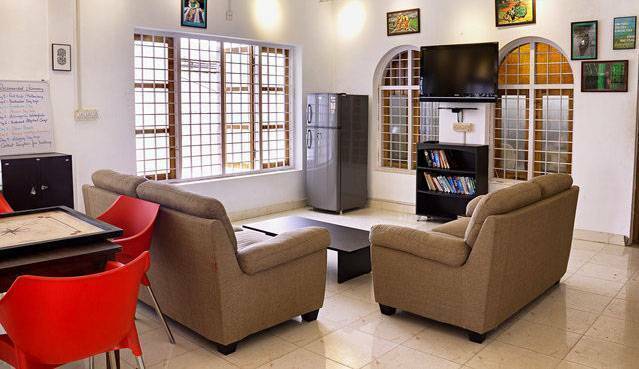 We offer shared 6-bed mixed and 6-bed female dormitory rooms as well as superior private rooms for families. Vedanta Wake up! 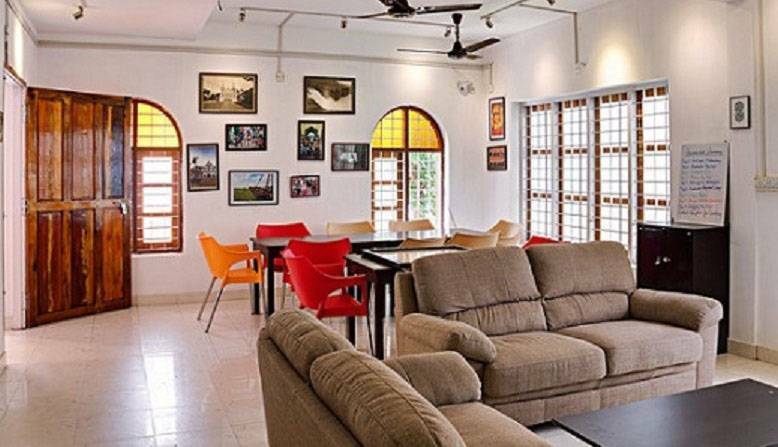 by the backwaters, Fort Kochi, is nestled right in the heart of the city and is at a 1 minute walking distance to all shops, restaurants, bars and local attractions such as the Chinese Fishing Nets, Fort Kochi beach, Santa Cruz Cathedral, St. Francis Church and Mattancherry Palace. We offer free Wi-Fi, linen, towels, duvets, hand soap and toilet paper. We also provide 24 hrs hot water supply. Our Deluxe Double rooms are air conditioned and well maintained with one very comfortable double bed, a flat screen television, a coffee table, and an ensuite bathroom. Our Deluxe 6-bed mixed dormitories are air conditioned and well maintained with 6 very comfortable bunk beds and an ensuite bathroom. Our Deluxe 6-bed female dormitory is air conditioned and well maintained with 6 very comfortable bunk beds and an ensuite bathroom. It is for our female guests only. 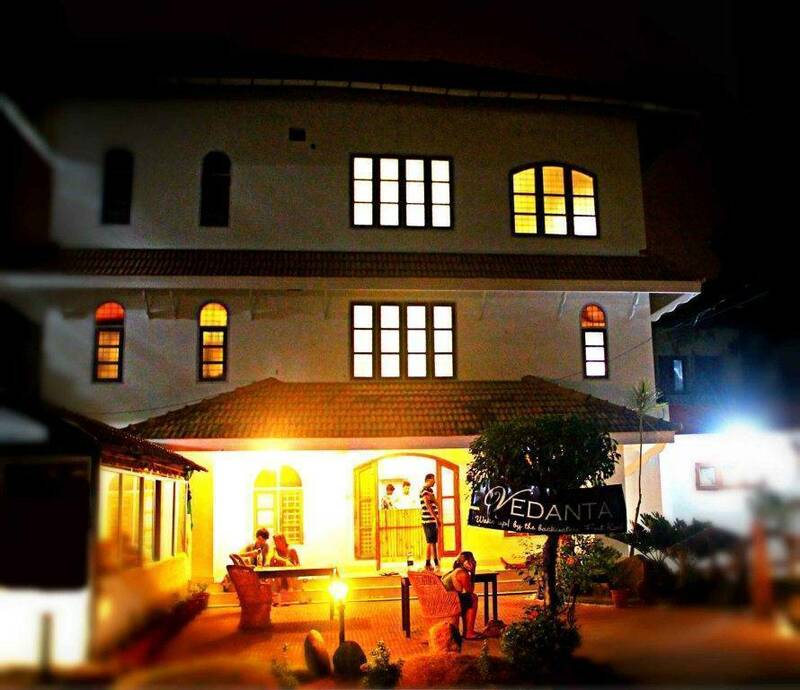 At Vedanta Wake up!, we offer you an environment to meet fellow travelers in our common lounge which is fully equipped with free Wi-Fi, a flat screen tv, movies, book exchange libraries, guitars, board games, maps and eateries. Our snack bar will provide you with hygienic and sumptuous meals cooked by our in-house chefs any time of the day at a very minimum charge. We provide assistance in arranging local tours and visits to nearby tourist attractions so that our guests can soak in the sights and sounds and have a memorable holiday experience. We also organize classes such as cooking, yoga, Indian classical music and ayurvedic massages. You can check in any time of the day. Our young and energetic team will provide you with every comfort possible to make your stay fun and unforgettable. We work very hard to ensure all our guests have a great experience and we assure you of our continued commitment to the highest standards of hospitality. 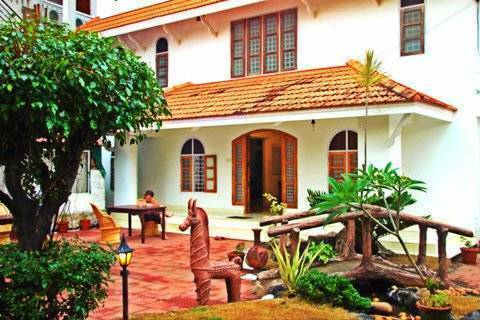 We are also present in Varkala and Alleppey. I. Deluxe Double Room a/c Inventory: 4 rooms Max Occupancy: 2 + 1 Extra Bed: 1 person @ Rs 500 This is a double occupancy room. Well air-conditioned and maintained with an en-suite bathroom, the room also has a coffee table and personal lockers. The rate is for the entire room. Ii. Room type: Deluxe Single Bed in a 6-Bed Shared Dormitory Room A/C Inventory: 24 beds Max Occupancy: 1 per room type Extra Bed: No Extra Bed For the convenience of backpackers and solo travelers, guests can book dorm beds on a per bed basis. 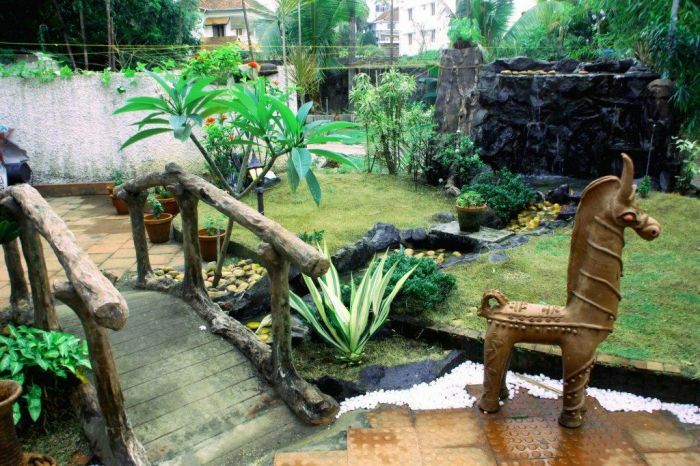 The rate is for a single bed in a Deluxe 6-bed shared mixed dormitory. The room includes six very comfortable dorm beds. The room is also maintained with an air conditioner, personal lockers and an en-suite bathroom. Ii. Room type: Deluxe Single Bed in a 6-Bed Female Dormitory Room A/C Inventory: 6 beds Max Occupancy: 1 per room type Extra Bed: No Extra Bed For the convenience of backpackers and solo female travelers, guests can book dorm beds on a per bed basis. The rate is for a single bed in a Deluxe 6-bed female mixed dormitory. The room includes six very comfortable dorm beds. The room is also maintained with an air conditioner, personal lockers and an en-suite bathroom.